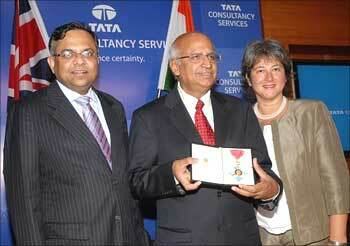 S Ramadorai has bid farewell to Tata Consultancy Services after being with the organisation for 37 years. Natarajan Chandrasekaran (fondly called 'Chandra' by colleagues and friends) will take charge as the managing director and chief executive officer of India's largest information technology services provider, Tata Consultancy Services (TCS), from S Ramadorai on Tuesday. Chandrasekaran is the third in the line of TCS's CEOs, after F C Kohli and S Ramadorai. Eighteen months earlier, speculation began to do the rounds on who would succeed Ramadorai. 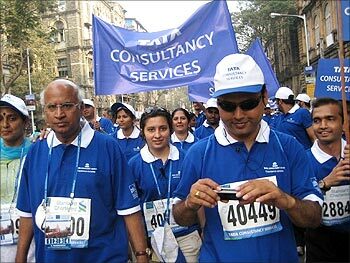 The latter had been the public face of TCS for several years, but was turning 65 in 2009. This is the retirement age for all Tata chief executives. A successor had to be found well in time. Several names began to do the rounds, but research analysts who believed that TCS also stood for 'Take Chandra Seriously' were not off the mark. "One good thing about the Tata Group and TCS in particular is the smooth process of change. When Ramadorai took over from Kohli, it was the same and he managed to take the company to newer heights. In a way, the culture is well set for growth of TCS. 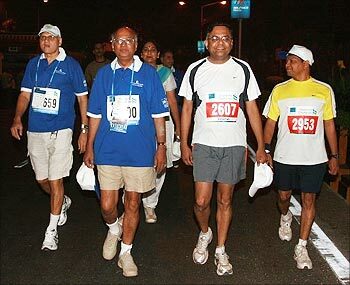 Image: Ramadorai with Chandrasekaran at the Mumbai Marathon. Chandra will follow the same culture. One other thing about TCS is that the company is very well-governed by its board of directors. The CEO has to follow guidelines. I think Chandra will work towards taking the company to much larger heights," said Deven Choksey of KR Choksey Securities. Atul Mehra, MD and Co-CEO of JM Financial, concurs: "Chandrasekaran has been a part of the senior management for a long time and working with Ramadorai for over a decade. In that sense, we do not see a major change in strategy or approach, and see a continued focus on the processes and delivery." The company's chief operating officer and executive director till date, Chandrasekaran began to interact with the media more than a year earlier. And Ramadorai, who will become vice-chairman of the company, told Business Standard in an ealier interview that, "I spotted him (Chandrasekaran) way back in 1996, and knew that he had the potential. Image: A long run ahead for Chandrasekaran. "Leadership decisions are not taken by flipping a coin." Ramadorai said he was particularly attracted by his (Chandra) "young, energetic and confident personality". 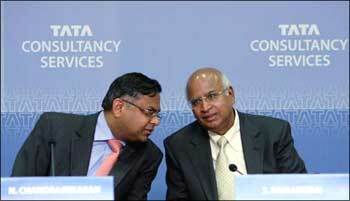 Chandrasekaran joined TCS on January 27, 1987, after graduating from the Regional Engineering College, Trichy. He started in Mumbai and did stints in California, Stockholm and Britain. In 1993, he moved to the US, where he built a team from scratch, getting deeply involved in customer management, too. He grew a telecom company into one of TCS' top five global customers. Chandrasekaran cut his teeth as a programme director, where he had considerable scope to navigate the business in the direction it is now following. After this, for two full years, 1997 to 1999, he worked as Ramadorai's executive assistant. It was here, many insiders say, that Chandrasekaran was silently groomed under Ramadorai's watchful eyes. Chandrasekaran, at the age of 45, is one of the youngest CEOs in India's IT sector. He has played a key role in helping TCS become a $6 billion global company with over 116,000 employees, in 50 countries and a client list which includes six of the Top Ten Fortune companies. As COO, Chandra was responsible for formulating and executing the company's global strategy. Chandra has been at helm of several key strategic transitions at TCS including being the architect of the new organization structure unveiled in 2008 which created multiple agile business units focused on domains and markets, as well as, the freedom to pursue new strategic business and give them the room to develop and mature. Under his leadership, TCS pioneered the creation of its unique Global Network Delivery Model and ventured into new markets including Europe, China and Latin America. Image: S Ramadorai (R) speaks to N Chandrasekaran. Chandra has been a champion of software and business quality in the industry. He has been the chief architect of TCS' Integrated Quality Management System, the quality model that was instrumental in TCS' becoming the first CMMI and PCMM level-5 organization in the world. 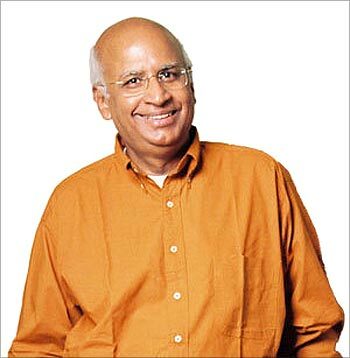 He also established the company's 'E-business' practice, and was responsible for setting up one of India's largest Offshore software development centres in Mumbai. He is on the board of several TCS subsidiaries. He is a member of Executive Council, National Association of Software & Service Companies (Nasscom). He is also a Director of E2E SerWizol Solutions Limited (A subsidiary of Tata Sons Limited) and NABARD Consultancy Services (P) Ltd. Image: S Ramadorai with N Chandrasekaran. Chandra is a senior member of the Institute of Electrical and Electronic Engineers, and an active member of Computer Society of India and the British Computer Society. He is also a regular contributor to conferences and seminars on Information Technology around the world. In April 2006, he was named by Consulting Magazine in the USA as one of the top 25 most influential consultants in the world. Well known for his passion for clients, Chandra is the executive sponsor for a number of TCS's large customer relationships and alliances. Chandrasekaran's brother NG Subramaniam is the president of TCS Financial Solutions. 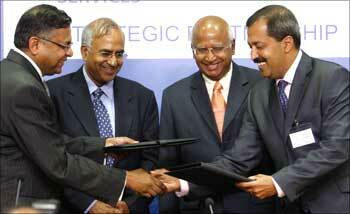 Image: N. Chandrasekaran (L), exchanges documents with Sanjar Nayar (R), former CEO of Citi Bank. As for Ramadorai, it has been a 'satisfying journey'. Ramadorai joined as a trainee engineer, worked his way to the highest position in the company. Ramadorai would continue his association with the company as the non-executive vice-chairman. Ramadorai took over as CEO in 1996 and has been instrumental in building TCS to its present day stature. When he took over, TCS earned just $100 million and had 6000 employees. Under his leadership, the company has grown to be one of the world's largest global software and services companies. His favourite quote is: No dream is ever too small, no dream is ever too big. 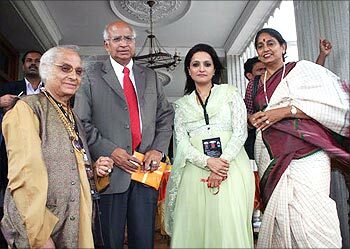 Image: Ramadorai with Pandit Jasraj, Durga Jasraj and wife Mala. Ramadorai says TCS has always been the leader and will continue grow to become one of the world's top ten software companies. "When I was appointed the CEO of TCS in 1996, we were an around $100 million company, and today we are among the leading services companies, serving top ten clients in the world and crossed the $6 billion mark," he said. In 2008, Ramadorai was recognized as the 'International CEO of the Year' at the 14th Annual LT Bravo Business Awards and the 'Asia Talent Management of the Year' at CNBC's 7th Asia Business Leader Award. Ramadorai will continue to be involved with the Tata group's super computer initiative and other key projects. He says every challenge is an opportunity and a good time to learn and work harder. "I find motivation in the people around me," says Ramadorai. 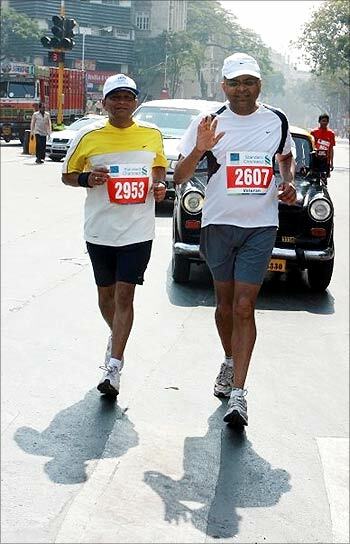 Image: Ramadorai at the Mumbai Marathon.